I recently took my wife and kids to see my side of the family in Illinois. My aunt was hosting a “barner” during the Halloween season, which I found out is just a gathering inside a barn (a very nice, furnished barn). Anticipating a five hour ride, I wanted to be adequately prepared as I was doing all the driving. Radio stations set? Check. Snacks? Check. GPS on my phone? Check. My family also had their necessary supplies, including loads of books and other reading materials. I saw this as a perfect opportunity to try out audible.com, a subscription-based audiobook service for mobile devices. I was halfway through a hardcover copy of The Great Deluge by Douglas Brinkley, an historical account of the government’s response to Hurricane Katrina (timely, right?). Although the topic is pretty depressing, the author’s writing brought so many of the details and people to life. Brinkley’s voice was very strong as he held both Democrats and Republicans to task for collectively failing to respond as they should have. I also felt a moral obligation to learn more about this dark period in our country’s history. With this audiobook downloaded to my wife’s iPod, we set out for Illinois. Once everyone had settled in, I turned on the second half of The Great Deluge as we traveled south on I-39. Within a half hour, I knew something wasn’t right. The specific details, the emotional response from the author, the personal stories about the victims and heroes of Hurricane Katrina – they were absent from the narration. Taking advantage of our next stop, I pulled the hardcopy of this book from my trunk and quickly skimmed and scanned the text. Sure enough. Whole sections of the book were taken out in the audio version. This was confirmed when I read through the details of my audible.com purchase. Beyond the disappointment that I felt because I couldn’t enjoy this book in it’s original form, I was also upset that Douglas Brinkley allowed this abridgment to occur. Why would any author agree to removing text from their book? If it wasn’t important enough to be included in the abridged version, why put it in their at all? The only case I could see where abridging a book would be appropriate is when modifying an inaccessible text for emerging readers, such as classic literature. Maybe the publisher’s argument is that people just don’t have enough time anymore to listen to a whole book, especially if they are ordering the audio version of it. I would disagree. For some kids, this is the only way they can access a book they have an interest in. For all kids, listening to stories read aloud is a great way to build vocabulary and increase listening stamina. My reason is much more simple: I want to take advantage of my free time by reading and hearing great literature. A half a day in a car sounds much more palatable when I have a good story to look forward to. 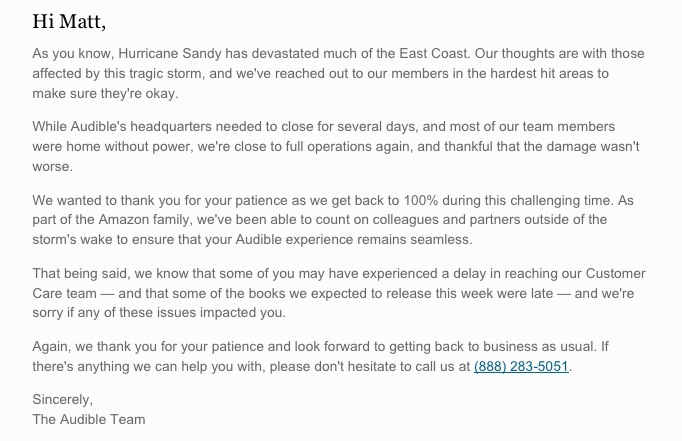 I had considered contacting audible.com to express my disappointment. I decided against it when around the same time I received an email from them, letting customers know how their employees were affected by Hurricane Sandy. Startled by the coincidence and saddened for those displaced, I resigned myself to just make sure I read the fine print before downloading my next audiobook.